UICC plays a unique and important role in the global cancer and health communities. Its purpose is to unite the cancer community, to reduce the global cancer burden, to promote greater equity, and to integrate cancer control into the world health and development agenda. This it does by focussing its day to day activities on convening, capacity building and implementing a clear advocacy agenda. 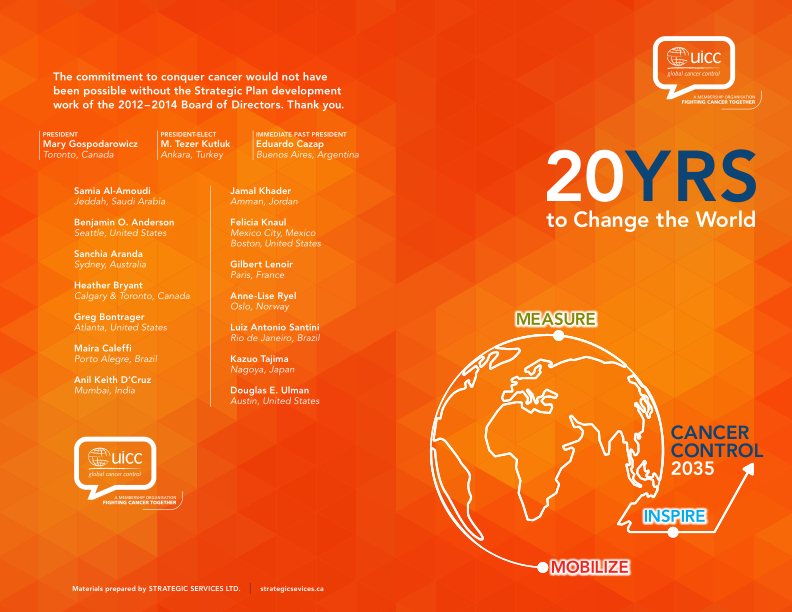 In 2015, the Board of UICC developed a compelling vision of how UICC should develop as an organisation in the next twenty years. We aim to continue to grow as a membership organisation, mobilising more resources for our community to increase our combined reach and impact. Along this path, we anticipate developing a suite of materials for the cancer community which increases their ability to develop and implement national cancer control plans. Of course, such an ambition can only be fulfilled if we are able to win the support of national governments around the world. Our recent wins at the United Nations and the World Health Assemblies has created high expectations and in order to ensure that countries follow through on their commitments, UICC will use its networks, membership, partners and convening platforms to show progress is being made and highlight any gaps and opportunities as they arise. We will inspire a movement across and from outside our community, developing new means to reach individuals and organisations who can impact the pace at which cancer is addressed globally. Our multi-sectoral approach will engage the private sector, UN agencies, young leaders, governments and the media through traditional and new social media channels. 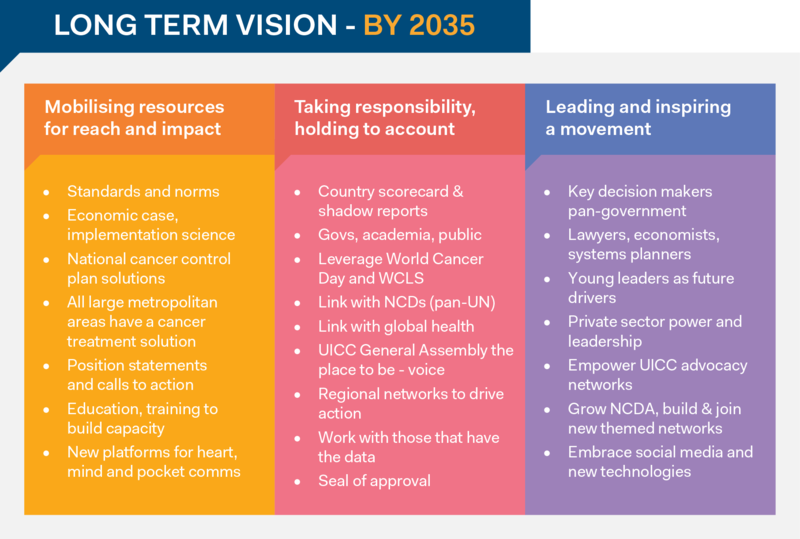 By 2035, we expect cancer to be a central consideration in all national health plans and the resulting increased investment in prevention, early detection, treatment and care will result in a lowering of cancer incidence and mortality, particularly in low- and middle-income countries.